Yesterday was the first race of the season for me. It was the Southborough and District Wheelers‘ open 10 mile time trial on a course (the Q10/33) near Tenterden. I’ve only been training since the start of the year so it felt a bit early to be going flat out. However, the good weather we’ve been having has meant that it’s been possible to get out on the bike consistently. I’ve built up to an average of about 100 miles a week. I’ll probably tick over at this level – I’m trying to be a bit less obsessive about the biking this year (it’s going to be a busy year for all sorts of reasons). I’ve started logging my rides on Strava. This has added a bit of edge to regular rides. Some of the drags are Strava segments and every time I climb them I’m measuring my time against my PB. I’m not convinced that the distance measured is constant (the Garmin GPS optimises the data points) but it does seem to have improved my hill efforts. Anyways… As it was the first race for a while I got properly anxious in the week leading up to the event. The day before the race I developed a Herbert Lom type tic in my left eye. If I met you at the race, I wasn’t winking – honest. I arrived at the HQ three hours before my start time. This was a little obsessive – no one else was there, not even the organiser. It did give me time to ride the course first. It’s a great country lane course with a swooping descent in the first half and a rough-surfaced climb through a woods on the way back. The weather was so good that I wore a skinsuit. I hadn’t wanted to do this – overweight and fluffy-legged – but longs would have been oppressive in these temperatures. The race itself was okay. The stated aim was to beat 30 minutes (‘evens’) and the real aim was to beat 28 minutes. At the finish I recorded 28:22. That seems a fair reflection of my current form.The race was won by team mate Peter Tadros (In-Gear Quickvit Trainsharp) with a 20:53. All being well I’ll race again in about a month and then pick up a few club events before trying to be more consistent through June and July. We’ll see! I never thought that I’d be doing this. I’ve only been back on the bike three weeks, so it’s probably a bit premature, but here goes. It’s going to be quite a low key season. The work I have lined up precludes many weekend events and there are exciting things going on in the family this year that knock out a few more. However, targets give focus so here are a couple to be going on with. They’re not very SMART because I’m a bit dubious about the value of SMARTness for what is effectively a recreational season. 1. Do a decent ride in the Ross-on-Wye and District CC 25 mile TT in July. This event (my Dad’s memorial race) has been a regular on my schedule since I’ve come back to racing. It’s on a faster course this year as well. 2. Put together an improving sequence of rides in the In-Gear evening 10m TTs. In-Gear Quickvit Trainsharp are running ten evening 10s from the end of May onwards. They’re all on the same course so it’ll be easy to compare performances. I also hope to ride some Eastbourne Rovers CC and Lewes Wanderers CC evening events again. I may manage to finally get to some Rye and District Wheelers CC and Hastings and St Leonards CC club events as well. In terms of other opens… There is a Southborough and District Wheelers 10 in March, a couple of ESCA events in April, a VTTA 10 and a Southborough 25 in June and perhaps a couple of late season events in September and October. This is nowhere near the number that I’d normally ride. I can’t say that I’ll miss all those early starts. One event I’d like to ride is the Duo Normande 2 up TT in Normandy at the end of September. I’d need to be a great deal wealthier and fitter to make that happen. I know I’m not riding the bike at the moment, but I’ve just bought the first photo of me in the new team kit. 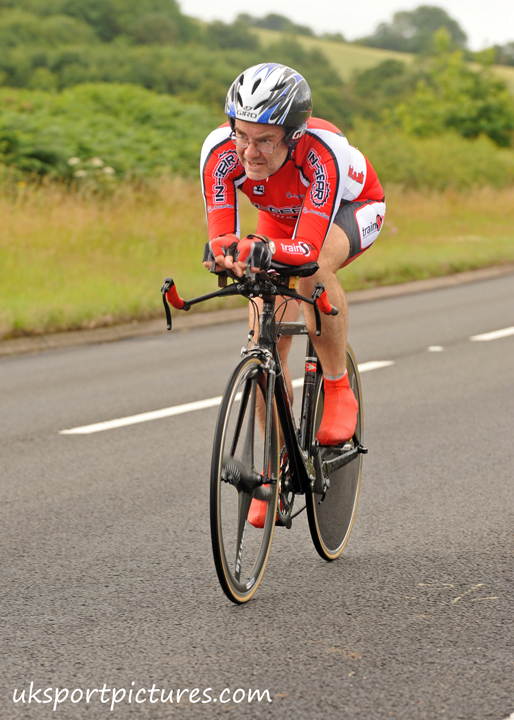 It was taken in the last few metres of the damp Don Woodman 25m TT near Abergavenny. You can just make out the not very aerodynamic wooden block under the arm rests that stops them slipping down. Last night was the fourth Lewes Wanderers‘ club 10m TT at East Hoathly (G10/87). Conditions were breezy, even windy in places. As last week, most of the headwind was on the homeward stretch, though it was predominantly a crosswind. After a couple of faster rides for the last two weeks I managed to put in my slowest ride of the season on this course. This was still a minute faster than last Thursday’s effort on the Pevensey minefield though. Winner Nic Baldo went 7 seconds faster than Thursday. The handlebars, with their jury rigged props in place, stayed put – hooray! I lost time most of the way around the course – 5-10 seconds per mile. I was on training wheels and wearing a standard road lid, so some of the losses were probably due to aero inefficiency and increased rolling resistance. The rest were due to me being distracted by the new job starting tomorrow. After bigging up PBScience last week I should also mention Trainsharp Coaching. Lead coach Jon Sharples is a member of In-Gear Quickvit Trainsharp and co-sponsors the team. No races this weekend. The closest I could have ridden was the San Faiy Ann CC 50m TT but three weeks ago, when the entry was due, I didn’t fancy racing that far with so little form. This was a wise decision as it turns out. The form hasn’t arrived and it was a stinker of a day with high winds slowing people down all over the country – even at the National ’10’ championships (well done to the In-Gear Quickvit Trainsharp riders – some good times there). This week’s training has been easy – about 40% down on the usual efforts. You need a periodic easier week to allow recovery and maintain interest. I did do a 50+ mile ride yesterday but today was another rest day. The new job starts on Wednesday. I’m down to work next Sunday so this may mean a DNS for next week’s race. It’s not something that I like doing, but the job comes first. I’ve decided not to enter the National ’50’ Championship in case something similar happens. It wouldn’t be good to rob someone else of a ride. Tomorrow evening is the next Lewes Wanderers‘ club ’10’. It looks as if it’ll be a breezy affair, so my target will only be another long 25 minute ride. I’ll be riding with some crude wooden chocks under the arm rests as an experiment. Despite being brand new and tightened to the correct torque, they’ve slipped down in every race I’ve used them in. >The Wigmore CC 25m TT was my first race ever in Kent. It’s a nice course with a good road surface and a ski-jump start. It’s all single carriageway, but wide and with good visibility. It was a warm, sticky morning. There was a strong breeze but long, tree-lined stretches neutralised it for much of the race. The £600 prize list attracted a good field of 105 riders. The early start and long drive to the event meant a good warm up was needed. Never mind. The new tri-bars were a bit of an adventure at first but once the race started I really liked them. I may be marginally lower which might be a factor in the hamstring and back pain I had after the race. The position felt good though, so I will stick with it. The best bit was that they didn’t move. My former team mate at Willesden CC, fast man Peter Dixon, was off eight minutes behind me. I made it a target to hold him off to the final roundabout (17 miles). In fact he only caught me in the last mile having gone slightly off course at the first roundabout. He clocked a very good 57:14 and looked powerful as he sped past. It was good to catch up with him. He looks set for another fast season. My new team mate Peter Tadros (In Gear Quickvit Trainsharp) continued his great form with a 3 second beating of the course record to win the event in 51:52. Twenty nine of the field were under the hour. I came 56th of the 82 finishers. I would have needed to do a long 1:01:+ to make my perpetual target of top half of the field. I think that would have been possible last season. However, starting from here, 1:05:33 is another small step forward. There’s a photo of me here that shows that I’m still carrying too much luggage around the midriff and that I’m collapsing forward too much. >Thursday night’s ride was a little disappointing but I think I kept a sense of perspective. Today, however, I may have let the negativity bug get to me for a while. I’m over it now. The event was the Sussex Cyclists’ Association 25m TT Championships on the G25/93 at Steyning. I’d not ridden the course before, but it’s a fair test with some gentle drags to get over. There was quite a breeze blowing but there didn’t seem to be any full-on headwind stretches. The bike went okay (though that right hand tri-bar still moves). I, however, went less well. I finished with a time of 1:07:431. The event was won by Peter Tadros (In Gear Quickvit Trainsharp) in a time of 52:16. Reflecting on it, there is still plenty more work to do and hence ground to make up. I’m effectively six weeks back into any sort of training and I’m still building base fitness. The race performances seem to be going backwards, but it’s much too early to establish any patterns. I’d thought of adding some interval work into the programme, but I probably don’t have the base fitness to make it tell yet. I’ll ride a couple of club 10m TTs this week to get in more time on the time trial bike. Note the average cadence of 73rpm. I need to increase that. No joy on the job search front. >I was back into ‘racing’ action this weekend. Yesterday was the East Sussex Cycling Association (ESCA) 10m TT on the G10/83 using the A22 South out of East Hoathly. It’s a nice course with the last mile being the hardest. It was a good, still day. I did a 26:34 which was disappointing. It reflects how much work I still have to do to get back to the level of fitness I had in mid-February. Today was another ESCA event – a ’25’ on the G25/89 which starts near Maresfield and takes the A22 South to turn at the same roundabout as yesterday’s ’10’. It’s a good, fair course with a slight gift start. It was chilly early on (gloves and knee warmer weather). Having embarrassed myself yesterday I tried to bend the odds today – skinsuit instead of road jersey and racing wheels rather than training hoops. That, and a decent night’s sleep, seemed to help. I was faster all round and covered the ’10’ course section in 26:25. I ended up with a 1:6:02. Still slow, but higher up the placings. Not a great début for my new team, In Gear Quickvit Trainsharp, but it was good to meet up with team mates and talk about the local racing scene. I’m not racing over Easter so I’ll try and fit a couple of mid-week, evening club events in over the next couple of weeks. >The recent cold and snow has pushed me back onto the turbo. Not that it has been much warmer inside our lean-to – a couple of sessions were done at 3°C and it is looking cold out there again today. Like a lot of cyclists I pretend to hate the turbo trainer, but really I’m just bored by it. This is especially true at this time of year when I’m building back to fitness. There are no really hard interval sessions to carry out (pain is preferable to discomfort in this context). These were amongst techniques suggested on the Time Trialling Forum – there’s also a thread “What’s the longest turbo session you’ve ever done?” which makes for scary reading – 5+ hours!? I’ve never managed more than 75 minutes. In a way I’m glad to have had such a concentrated batch of turbo sessions – it’s got me back into the habit. It also gets you fit very quickly. I hope I’ll cope a bit better with riding with the veterans at Hillingdon this week! Of course, I’m writing this post to delay today’s turbo session. In other news,we had the Willesden CC AGM yesterday. I am no longer time trial secretary (my first and last annual report is here). Indeed, I am no longer a first claim member of the club. From next season I will be riding for In Gear Quickvit Trainsharp, a team based in Uckfield, close to where we hope to be living in Sussex. I’ll remain a second claim member of the Willesden and hope to see some of them at races. The house move is now waiting on the chain to form. Someone down the line needs to find a place to live. After months of making decisions about our future, we are now subject to the vagaries of other people’s decisions. It doesn’t feel so good.